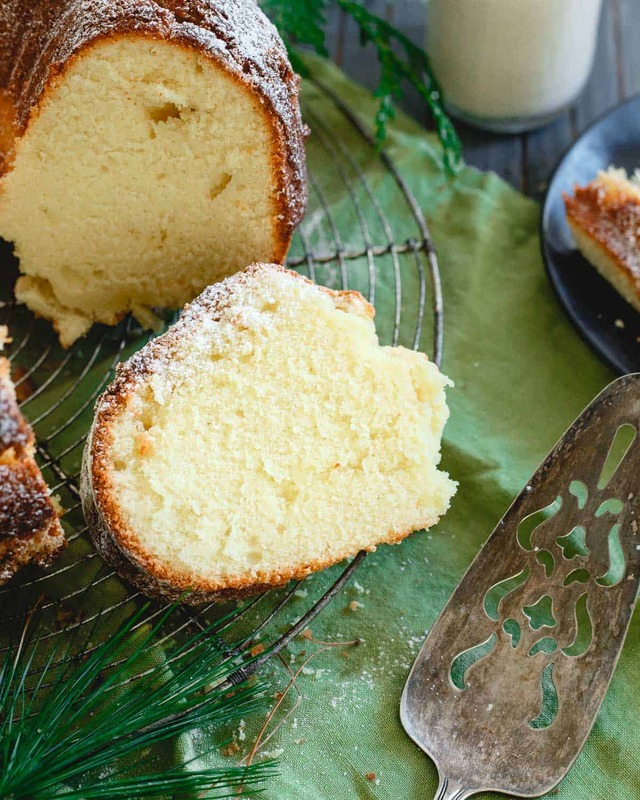 This apricot brandy pound cake is so incredibly easy to put together, perfect for the holidays and absolutely delicious – a showstopper of flavors! *This post for Apricot Brandy Pound Cake was originally published December 22, 2011. It’s been updated with new photographs. 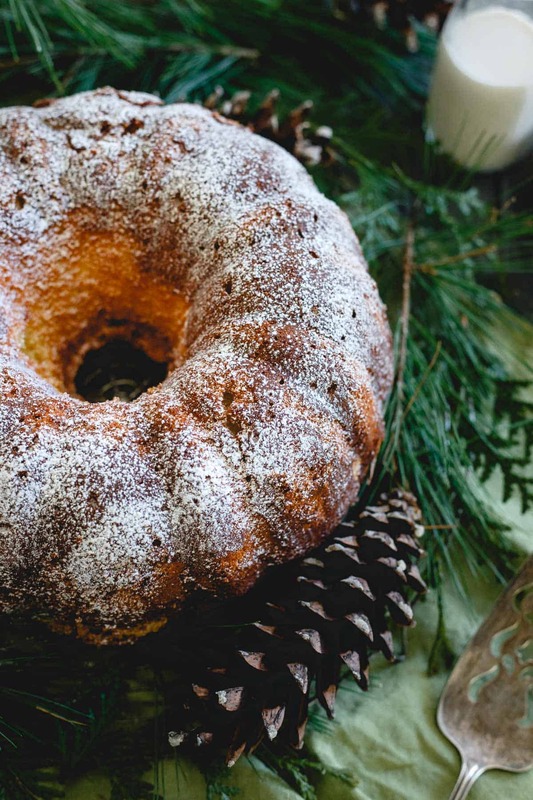 Apricot brandy pound cake has been a staple on our holiday table for years now. It may be humble in appearance (be generous with that powdered sugar topping) but it’s flavor is indescribably delicious and it’s only made better by how simple it is to put together. Make it a few days ahead of time because the cake just gets better as it sits and the flavors have time to soak in. It also freezes incredibly well. It’s an indulgence for sure but that’s what the holidays are about, right? Hope you enjoy it! Content below is original and you can bet I’m rolling my eyes at myself from six years ago as I read it too. Oh, hello there you gorgeous boozy thing of a cake. Me and you have a date Christmas Eve night. Dessert table, let’s say around 9pm, don’t be late. I’m willing to look past your less than stellar traits for one night of pure bliss. I’ll admit up front, this will probably be a one night stand. You’re just not really my type. I can’t see myself with you everyday, but you seem pretty delicious and fun for a night. No need to bring any accoutrements, just you. I’m easy to please. It’s fine. You’d understand if you tasted a piece. This is probably the simplest and yet the most flavorful and rich cake I’ve ever had. It doesn’t hurt that there’s brandy in it either. A little more brandy than the recipe calls for too (oops). I think this recipe for apricot brandy cake comes from my great aunt Rose who lives in Delaware. Lucky for us, we somehow got our hands on the recipe a few years back and have been making it for the holidays ever since. It’s an indulgence to the max (just look at the ingredient list) and every flippin’ bit worth it. The cake itself is so rich and perfect there’s honestly no need for fancy glazes or icing. Just a sprinkling of powdered sugar to make it shine. It’s all done in your stand mixer (I suggest not being too diligent about getting all the batter out when you transfer it to the pan, you’re gonna want to lick that thing clean, trust me) which makes clean up a cinch and it gets even more flavorful the longer it sits. It’ll be the best one night stand you’ve ever had. Love this Apricot Brandy Cake recipe? Check out this glazed orange cardamom cake or this applesauce raisin skillet cake for more simple but absolutely delicious holiday cake options! 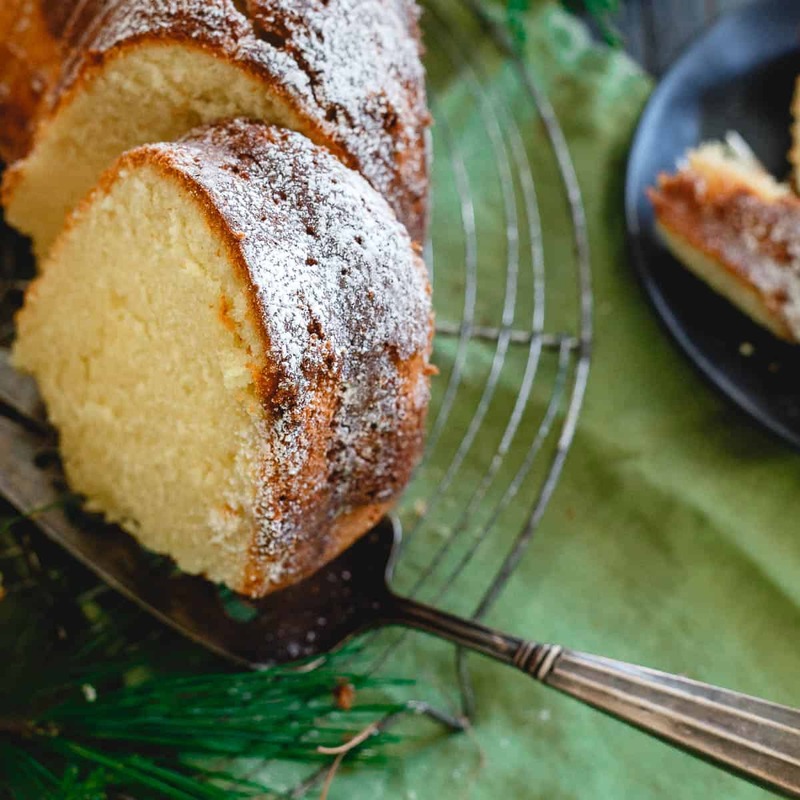 This apricot brandy pound cake is so incredibly easy to put together, perfect for the holidays and absolutely delicious, a showstopper of flavors! Cream butter and sugar together in a stand mixer. Add all other ingredients except flour and mix to combine. Add flour and mix on a low speed until fully combined. Pour batter into a very well greased bundt pan. Let cake cool completely in pan on a cooling rack and then invert to remove from the pan. Wrap cake tightly in plastic wrap, aluminum foil and seal tightly in a plastic bag until serving. *Feel free to make this cake a few days before serving. Wrap it as directed in the directions, it just gets better as it sits. **This cake freezes very well. ***I've lessened the sugar by 1/2 to 3/4 a cup and also used whole wheat white flour before and the cake comes out just fine. It's a very forgiving recipe. and brandy in desserts, rum in cookies, creme de menthe in bars…boozing it up WITH desserts is always a beautiful thing! Great recipes and from your IG feed, you were BUSY yesterday! ha! I didn’t realize that was a question in reply to Averie’s comment. Dense. I wasn’t much of a cake person, but after the enormous piece I had at work yesterday, I think it’s really growing on me. That looks amazing and I’m not just saying it because I haven’t eaten since breakfast. Apricots+brandy+cake= perfection. :) It looks so moist and delicious. A perfect after treadmill snack. ha ha! Just kidding. YUM!!! GORGEOUS picture. Third one down is my favorite. Whoa. I can already taste and smell that cake! Enjoy!! Must make. NOW. It looks beautiful! I made this cake today and greased pan well, it stuck to the pan and came out with chunks left in the pan. Directions may need changing to grease and flour the pan and then add batter. sorry it stuck for you, Joyce. I’ve never had that issue by just greasing well. This looks so delicious. I am becoming slightly obsessed with this shape of cake lately. It’s an okay thing to be obsessed by, right! Such a perfect dessert for the holidays! Love the updated photos. I want a slice!! Isn’t it fun looking back on old posts? Mine only go back 2.5 years and I cringe too haha. Pound Cake is my all time favorite cake and this flavor combination sounds so amazing!! What a gorgeous pound cake. And the flavors!! Love the flavors Gina! 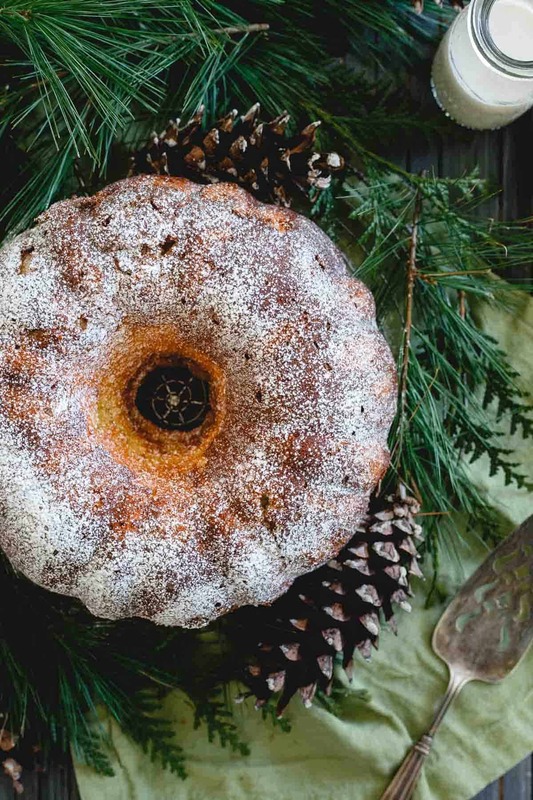 Nothing beats a bundt around the holidays! Always looks pretty, tastes delicious and is so easy! Holy moly this looks so good! What a gorgeous cake! Love that it’s so easy and yet so flavorful! Win-win in my book! Perfect for the holidays! I made this cake last year and just to let you know I made 3 additional ones within the next couple of weeks it was SOOOO delicious. 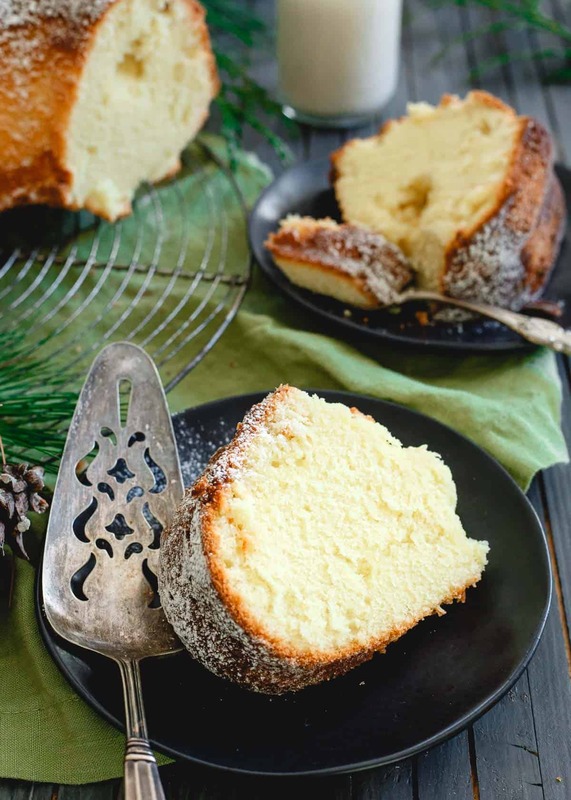 Gina, you describe this delightful cake perfectly, I can’t wait to make it again this year and I even plan on flying it halfway across the country for my family Christmas celebration!! Thank you! My husband is allergic to alcohol; he can eat items where the alcohol gets cooked off. Wondered if apricot nectar would work….? Never tried it but the recipe is pretty forgiving and I’m betting it would work ok! The cake is amazingly delicious. Too bad I can’t post my pics. If you serve this cake at a gourmet luncheon, how would you dress it up for presentation ?